Working closely with utilities to ensure the products we provide meet their stringent specifications. The utility market offers a critical service to the public and demands high-quality products. Shawcor has a long history of working closely with these utilities, many of whom approve of and specify our products. 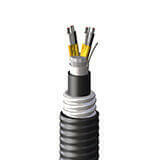 Shawcor offers top-quality instrumentation cable to the utility market. Our large variety of cable configurations and shielding construction make our products ideal for utility applications, such as the instrumentation and control cable used in all types of utility substations. Ensuring reliable electrical and physical performance over long-term service, Shawcor cables have a proven track record of delivering dependable performance in the most demanding environments. Shawcor instrumentation products are available in CSA 150, 300, 600 and 1 kV or UL 300V and 600V, armored or unarmored tray cable, and many types of shielding options and jacket types. Thermocouple extension grade is also available. ShawFlex thermocouple extension cables offer advantages in cost and mechanical properties when used for connections between thermocouples and instruments. Tray Instrumentation cables can be used to minimize noise and signal interference by preventing crosstalk between pairs and triads. 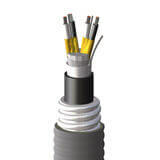 This cable can also be used to convert analogue or digital signals. Tray Instrumentation cables can be installed in raceways, direct burial applications and in outdoor exposed industrial applications. Armored instrumentation cables can be used to minimize noise and signal interference by preventing crosstalk between pairs and triads. 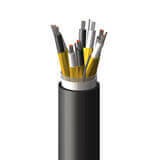 This cable can also be used to convey analogue or digital signals. Tray instrumentation cables can be installed in raceways, direct burial applications and in outdoor exposed industrial applications. The main certificates are, CSA 22.2 NO. 239, CSA 22.2 NO. 174, CSA FT4, SUN RES, Direct Burial, -40°C cold bend/impact. Armored instrumentation cables can be used to minimize noise and signal interference by preventing crosstalk between pairs and triads. 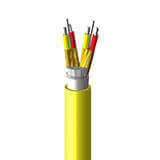 This cable can also be used to convey analogue or digital signals. Tray instrumentation cables can be installed in raceways, direct burial applications and in outdoor exposed industrial applications. The main certificates are, UL 13, UL 2250, IEEE 1202 (70,000 BTU/hr), SUN RES, -40°C cold bend. These tray instrumentation cables can be used to minimize noise and signal interference by preventing crosstalk between pairs and triads. 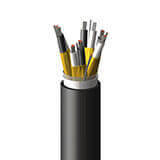 This cable can also be used to convey analogue or digital signals. Tray instrumentation cables can be installed in raceways, direct burial applications and in outdoor exposed industrial applications.